Although Magic Sam passed away over 40 years ago, his recording catalog continues to grow, courtesy of Delmark Records. The Chicago label has released several albums of material over the past couple of decades, mostly outtakes and alternate versions of studio tracks and a couple of live recordings that featured dynamic performances, but inferior sound quality. Magic Sam fans were content with these recordings, however, because they figured that was all they would ever have to represent Magic Sam in his element�.on stage in front of a receptive audience. Well, Delmark has set the bar much higher with the release of a new live recording, Live at the Avant Garde. Recorded by a young high schooler, Jim Charne, at a Milwaukee club on June 22, 1968, this set features Magic Sam, with Big Mojo Elem on bass and Bob Richey on drums, working through a 65 minute set of tracks from Sam�s most recent studio effort (West Side Soul), songs from his upcoming release (Black Magic), familiar tunes from his earlier years, plus a few choice covers that he had never previously recorded. Charne provides liner notes describing the recording process and the scene in the club. Despite the primitive equipment and less than ideal conditions for recording, the sound is very good, a marked improvement over the other two live Magic Sam recordings previously released from Delmark. 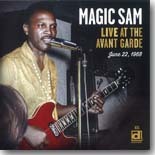 Magic Sam�s performance is spirited and enthusiastic, though the vocals are a bit fuzzy on a couple of tracks, and Elem and Richey provide solid support. Magic Sam fans will be familiar with most of the songs on this set, but there are some classic cover tunes from others (Junior Wells� �Come On In This House,� Otis Rush�s �All Your Love (I Miss Loving),� Muddy Waters� �Hoochie Coochie Man� and �Still A Fool,� and Jimmy Rogers� �That�s All Right�) that will be pleasant surprises to hear. What�s most amazing about this set is that it has never come to light before. It�s hard to believe that it has basically been on a shelf for 45 years and very few people have ever heard it. Magic Sam fans owe a huge debt of gratitude to Delmark Records for finally seeing that this album gets to be heard. If you�re a fan of Magic Sam or of Chicago Blues in general from its beginnings, you owe it to yourself to get your hands on Live at the Avant Garde.